Grantham Scholar Monica Ortiz has been a shining example of how academics can use outreach to spread the environmental message. In this, her last blog before graduating, Monica tells us about the next generation of environmental thinkers – kids. Well done Monica, we’ll miss you! My time as a Grantham Scholar is soon coming to an end: I’ve already received the important but polite email from my department reminding me of my deadline (as if it’s not the last date in my mind before I sleep). I’ve spent the last 6 months job hunting and doing interviews in search of a real answer to the “What’s next for you?” question (side note: I succeeded!) And, most importantly, the massive creature I call my thesis is slowly but surely taking the right shape. 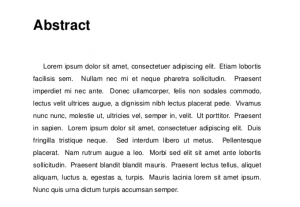 This is what everyone’s thesis looks like, right? I am grateful beyond measure for the opportunity to have studied at one of the best universities in the UK – the University of Sheffield – as a fully-funded international student. I am grateful for the friendly Northern soul of the city that has been my home for the past four years. I am thankful for the many learning and professional training opportunities offered by my department and the Grantham Centre. I am also deeply appreciative of all the kind, hardworking, and brilliant supervisors and mentors, colleagues, and friends I have met along the way, and also all those who got me here in the first place. I used to work with children and adults as a nature guide. 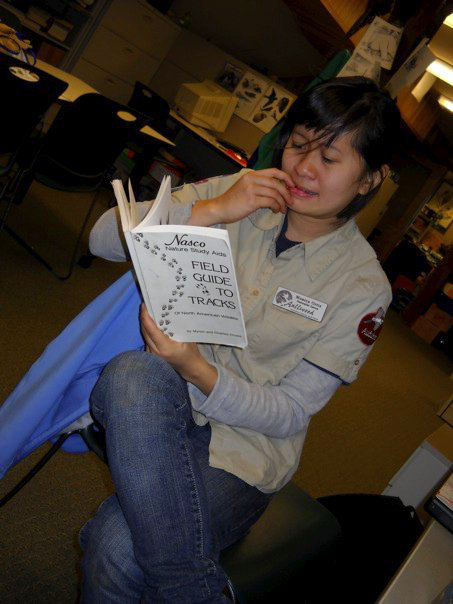 Here I am hard at work learning animal tracks! Apart from all the training and learning opportunities, one of the reasons I’ve enjoyed the PhD is that my department also offers graduate students to assist or lead teaching. Before I started the PhD, I was teaching at a university in the Philippines and in local communities that were keen to learn more about climate change. Prior to that I worked and volunteered in environmental education and taught during my Master’s degree, so teaching—and teaching about climate change – are truly part of my identity as a person. It was therefore a great pleasure to be invited by Dr. Manoj Menon (a Grantham Centre supervisor) and Dr Maria Romero-Gonzalez to lead a short session and workshop on climate change to Year 12 students on a Headstart summer school program funded by the Engineering Development Trust (EDT), which is a 3-day residential program for students interested in STEM. 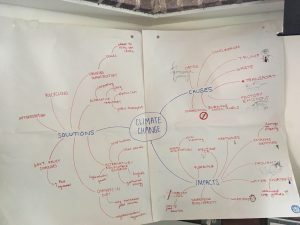 After discussing the basics of climate science and its impacts, I invited the students to create a “mind map” of several concepts around climate change: its causes, its effects, and potential solutions. 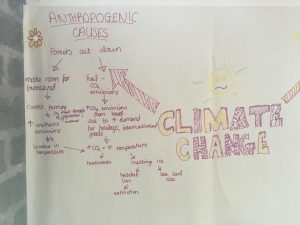 More than the creation of the actual mind map itself, the sneaky purpose of the activity was to really engage the students into discussion about what they thought about the interconnectedness of climate change to our environment and our lives. Some of the pictures that I asked the students to link together included a picture of US President Donald Trump during his press conference when he withdrew from the Paris Agreement, a plate of meat versus a plate of veggies, and flooded cars near a Tube station. Together with the help of some very capable student ambassadors, some of the topics I overheard talked about by Year 12 students at the tables were: whether lab-cultured meat would be a sustainable option, how feed crops are using land that could be used for food, the importance of education and perception in shifting consumer choices, and how deforestation is such a far-reaching environmental problem. I was completely impressed by the knowledge and wisdom that I heard in that room from people half my age (what did I know in Year 12? I think I was writing a dorky song about phosphorous for my environmental science class). It gives me hope to know that the future of our earth is in amazing hands. So, while the ticking clock of my time as a student winds down, the future sustainability leaders, climate change-solvers and environmental innovators, are just getting started. I remain optimistic for the future of the planet as long as we keep challenging ourselves – and both the younger and older generations – to think more sustainably.